Hey, graduates... You're school days are finally over. It's time to relax, help yourself, like when you came to think how awesome your rewards were after receiving them on stage, in front of thousands of people including your parents. That is very remarkable moment of your life, as a student who made that far, ready to face the world and its reality. But wait how can it be so relaxing, when you've got something so special, a face of politico embedded on your metallic medal. Yeah, the photo might be old enough but justifies how awful politicians are, even up to this day. Although it's seriously disgusting for every student, the guy who actually received the medal shared it online to make fun of it. Everyone who seen the photo posted hilarious comments. OK mayor, it's payback time! Here are some of the few commemorative speeches for your previous "Epal moves." Nice of your Mayor to give you anting-anting pangontra sa aswang. Lol, but in all honestly, ang kapal ng mukha. Goddamn, I wonder if that thing also glows in the dark. DepEd should be rejecting such awards as being hijacked for partisan branding and marketing. Ikaw ang nagpakiharap mag aral. Tapos ang award mo si Mayor... Yuck! Magbubulakbol na lang ako pag ganoon. Kung ganito na lang din, Instead na maging proud ako sa medal ko, mas feel ko pa ibaun sa lupa. Sino ba talaga ang may award. Langya pag dinisplay mo yan sa bahay mo hindi ka makakaramdam ng pride. Maiirita ka lang kasi parang dinisplay mo yung mukha niya. 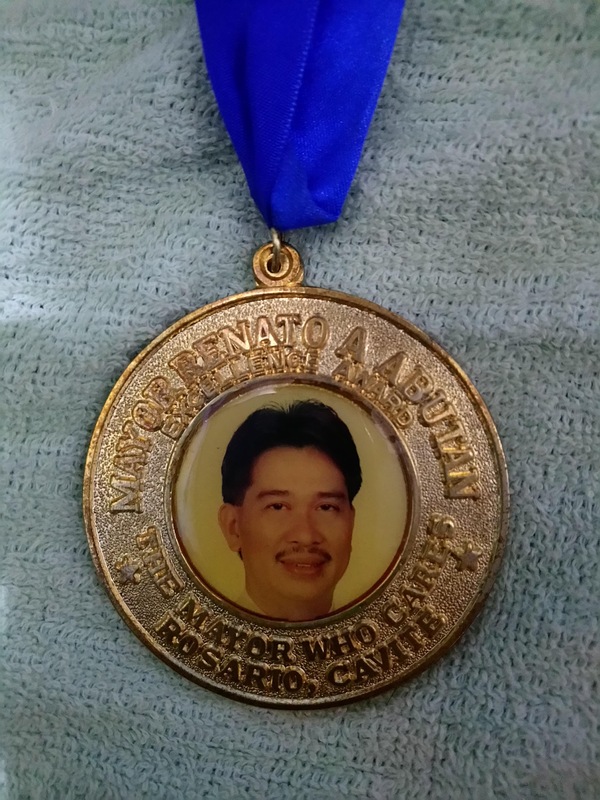 The politician's face engraved on the medal was the former town mayor of Rosario (Salinas) Cavite Renato A. Abutan, he was an active mayor back the years 1998 to 2007. Although, he is no longer seeking any government post in the elections he still currently working under Cavite Gov. Juanito Victor “Jonvic” Remulla. I personally have the same situation, back the days of the former President Gloria Arroyo I took a short term course for mobile phone servicing. The TESDA certificate I got from my vocation was filled with the huge face of the former Congresswoman Nanette Castelo Daza. Honestly, graduation ceremonies are always packed with politicians. Even "Kiko Pangilinan Award" is rampant during my grade school and high school days. DepEd are turning deaf ears, it is acceptable to earn awards under the name of a person who did exceptional contribution for humanity as a whole. But for politicians should there be regulations not crossing the line. Do you have any souvenirs from your graduation with 'Epal' politicians? I posted this photo on my Facebook page you're welcome to post them on the comments. Thank you for reading This 'Epal' Politician Took Graduation Award to the Next Level posted on the website Kwentology if you want to redistribute this article please include the link as the source. Have some kuwento to share? Contact us!